A good remake of a retro gaming classic has to evoke the feeling of playing the original while making the game feel fresh and new. Blaster Master Zero for the Nintendo Switch is a very good remake of a retro gaming classic. So good. You may have seen the name on release lists. You may have seen the listing in the Switch eShop and wondered what the hell this pixelated anime nonsense was. I was a bit thrown by this myself. 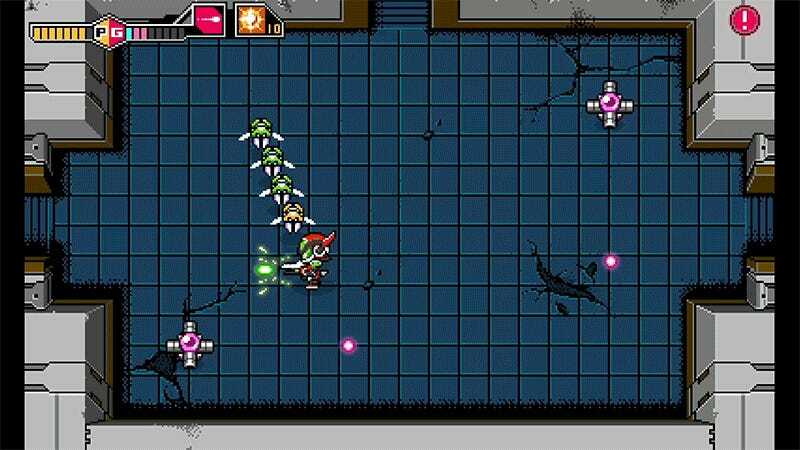 Blaster Master Zero is a fine recreation of the 1988 Sunsoft classic for the NES. They’ve taken some liberties with the story, which might upset some fans, but when you consider the North American version of the first game was about a boy looking for his frog and the Japanese version is about a boy piloting a mech to defeat a space emperor, they’ve got some wiggle room. The main character, Jason, is still after a frog named Fred, but his interest is scientific rather than any sort of friendship. In the middle of his adventure he is joined by a girl named Eve, who becomes the mechanic for the tank he’s piloting, Sophia 3rd. The gameplay is intact, which is what really matters. Jason drives Sophia through maze-like game levels, searching for his escaped frog. At any time he can exit his ride, which can be handy for unlocking doors or searching for vehicle upgrades to help them get to the next area, Metroidvania style. That’s the side-scrolling platformer section of the game. Littered across the levels are dungeons, which Jason takes on by himself in top-down shooter fashion. There’s a whole bunch of new stuff in Blaster Master Zero—new bosses, new sub-weapons and such. But what’s even better is what’s been improved over the original. Control is much better than it ever was, particularly while driving Sophia, which was a bit of a floaty mess in the original. And while the infamous grenade glitch (players could launch a grenade at a boss, hit pause and have it continue doing damage) is gone, the shooting controls are really tight, making it easy to fire, even on a diagonal. As for the inclusion of Eve, a character who didn’t appear in the original game but eventually wound up being Jason’s in-canon wife (with an appearance at the end of the Wii version), it’s nice to have a little banter before a big battle. Blaster Master was one of my favorite games on the NES, right up there with Super Mario Bros. 3. I’ve played the original recently, and while the nostalgia factor was there, the satisfaction I felt with it as a teenager wasn’t quite there. I found it again in Blaster Master Zero. Blaster Master Zero is available for $9.99 on the Nintendo Switch eShop. It’s also available for 3DS, though I couldn’t imagine playing it on a tiny screen after rocking that tablet.